The changeover from the mosaic of different heterogeneous national accounting standards to the International Financial Reporting Standards has not been easy. For many companies IFRS, and most particularly the concept of fair value in IAS 39, has amounted to a phase shift – which is prerequisite to achieving compliant financial reporting. The research conducted by Dr. Chorafas for this book, documented that the process of meeting IFRS requirements presents opportunities and challenges to all enterprises. As many companies have found out, abandoning the classical accruals accounting for marking-to-market their transactions and portfolio positions, has not been easy. The conversion process has affected several functions within the organization including balance sheets, P&L statements, auditing, risk control, information systems, and management accounting. 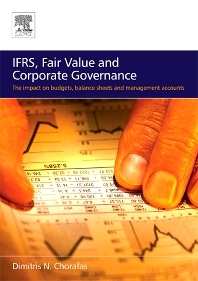 Part Three brings together IFRS and management accounting requirements, with emphasis on fair value. The book has many case studies based on actual experiences. These range from the implementation of IFRS directives such as hedge accounting, to developing practices of real-time balance sheets; the help provided by sophisticated accounting solutions help in stress testing; and a comprehensive definition of the role of the audit committee. PART ONE BUSINESS COMPETITION, STANDARDS BOARDS, AND CORPORATE ACCOUNTING: Chapter 1 NEW RULES OF COMPETITION AND ACCOUNTING STANDARDS; Chapter 2 INTERNATIONAL ACCOUNTING STANDARDS BOARD (IASB) AND CORPORATE GOVERNANCE; Chapter 3 DYNAMICS OF INTERNATIONAL FINANCIAL REPORTING STANDARDS (IFRS); Chapter 4 THE CONTROVERSY OVER IAS 39; Chapter 5 IAS 39 AND THE RECOGNITION OF DERIVATIVES RISK. PART TWO IMPLEMENTING IFRS: Chapter 6 PROJECT MANAGEMENT FOR IMPLEMENTATION OF IFRS; Chapter 7 AN IFRS TASK FORCE CASE STUDY. TOP MANAGEMENT'S RESPONSIBILITY FOR FAIR VALUE ACCOUNTING. PART THREE MANAGEMENT ACCOUNTING AND THE BUDGET: Chapter 8 MANAGEMENT ACCOUNTING AND CORPORATE GOVERNANCE; Chapter 9 BUDGETING. A CASE STUDY ON FINANCIAL PLANNING; Chapter 10 VALUING ASSETS. THE CHALLENGE OF BEING "RIGHT"; Chapter 11 BUSINESS ETHICS ADD VALUE TO FINANCIAL DISCLOSURES; Chapter 12 FORWARD LOOKING STATEMENTS, MODELS, EARNINGS, AND GOODWILL. PART FOUR CORPORATE GOVERNANCE AND THE BALANCE SHEET: Chapter 13 BALANCE SHEETS AND INCOME STATEMENTS AS MANAGEMENT TOOLS; Chapter 14 ECONOMIC CAPITAL IS AT BOTH SIDES OF THE BALANCE SHEET; Chapter 15 THE REAL-TIME MANAGEMENT REPORT; Chapter 16 INTERNAL CONTROL, STRESS TESTING, AND EFFECTIVE RISK MANAGEMENT; Chapter 17 ROLE OF THE AUDIT COMMITTEE. The book divides into four parts. Part One: addresses the fundamentals of management accounting as contrasted to regulatory accounting procedures and financial reporting by public companies. This text is the product of personal experience, and much experimentation at major companies, in efforts to determine how their managers can best understand the firms vital accounting figures, and how company goals can be met in a cost/effective manner. The text explains the function of management accounting and of internal management accounting information systems – (IAMIS). The budget which is a financial plan, and Budgetary control to assure that planned and financed activities are executed in the intended manner. Part Two: focuses on the concept and practice of experimentation through simulation. First, it defines financial modeling – its nature and its role. Then it demonstrates how and why financial modeling is concerned with the translation of business events into the language of decision-makers. This presentation is enriched with a lot of comprehensive case studies. The theme of Part Three is the organizational prerequisite for successful development, implementation and use of financial models – within the management accounting and budgeting perspective. Organizations are made of people and, as this book demonstrates, their motivation is crucial in obtaining commendable results. People are assisted through technology. Therefore, the book outlines the necessary technological infrastructure, and, by means of practical examples, it explains how it can be used effectively. Since 1961, Dr Dimitris N. Chorafas has advised financial institutions and industrial corporations in strategic planning, risk management, computers and communications systems, and internal controls. A graduate of the University of California, Los Angeles, the University of Paris, and the Technical University of Athens, Dr Chorafas has been a Fulbright scholar. Financial institutions which have sought his assistance include the Union Bank of Switzerland, Bank Vontobel, CEDEL, the Bank of Scotland, Credit Agricole, Österreichische Länderbank (Bank Austria), First Austrian Bank, Commerzbank, Dresdner Bank, Mid-Med Bank, Demir Bank, Banca Nazionale dell'Agricoltura, Istituto Bancario Italiano, Credito Commerciale and Banca Provinciale Lombarda. Among multinational corporations Dr Chorafas has worked as consultant to top management, are: General Electric-Bull, Univac, Honeywell, Digital Equipment Corp, Olivetti, Nestlé, Omega, Italcementi, Italmobiliare, AEG-Telefunken, Olympia, Osram, Antar, Pechiney, the American Management Association and host of other client firms in Europe and the United States. Dr Chorafas has served on the faculty of the Catholic University of America and as visiting professor at Washington State University, George Washington University, University of Vermont, University of Florida, and Georgia Institute of Technology. Also, the University of Alberta, Ecole d'Etudes Industrielles de l'Université de Genève, and Technical University of Karlsruhe. More than 6,000 banking, industrial and government executives have participated in his seminars in the United States, England, Germany, other European countries, Asia and Latin America.